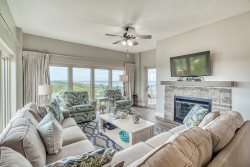 Villa Coyaba is the premier luxury condominium complex on Destin's Scenic Hwy 98. This unit is ready for your family beach vacation as it has just been renovated with new paint throughout, new carpet, updated drapes and a bunk room. It is just a few steps to the beautiful emerald green waters of the Gulf. Professionally decorated and recently updated this spacious beach front condo sleeps up to twelve in comfort. Each bedroom boasts flat screen TV's and comfortable mattresses. A large balcony with seating for outdoor dining overlooks Destin's emerald green waters and sugar white sands. A well-equipped kitchen with Viking appliances and granite counter tops allow for the option of dining in but many of the areas finest restaurants are also nearby. The living area has seating for the whole family and friends. Enjoy the large flat screen TV or just relax and watch the sunset. Guest Bedroom - King Bed, Jack and Jill Bathroom with Shower/Tub Combo. - A block away from DESTIN COMMONS, the areas best shopping. 25% is due at booking which holds the unit for you and is applied toward your rental fee. Full payment is due 30 days prior to arriving. Add $205 for housekeeping and 11.5% for tax. There is a $69 damage protection fee; 2.09% to process credit card payments.